NOTICE: Hand breath is usually measured at the metacarpals. - average body height = 160.8 cm (hand length vs. body length ratio = 12.0 %). NOTICE: Another (slightly smaller) study from Nigeria reported even larger figures for hand length. - average body height = 170 cm (hand length vs. body length ratio = 11.0 %). - average body height = 176.7 cm (hand length vs. body length ratio = 10.6 %). - average body height (males + females) = 172 cm (hand length vs. body length ratio = 10.6 %). - average body height (males + females) = ?? cm (hand length vs. body length ratio = ??). - average body height (males + females) = 163 cm (hand length vs. body length ratio = 10.9 %). - average body height (females only) = 152 cm (hand length vs. body length ratio = ... females only: 11.2 %). - average body height (males + females) = 165 cm (hand length vs. body length ratio = 10.6 %). Re: Which country has the largest hands in the world? ... one can make interesting observations from these data! - All populations show that females have relatively longer fingers than men (however interestingly... only when compared to hand breadth; but not when compared for palm length, and neither for body length!!). - All populations show that men have more 'square' shaped palms, but in the perspective of body length this sexe-difference is basically only the result of that men clearly have wider palms... but only slightly longer palms: resulting in that men have relatively larger palms than women have! ... Wow, this indicates that women do not really have (relatively) longer fingers than men: for, there appears to be only a sexe-difference in the "finger length vs. palm width ratio"! - In the perspective of full hand length and palm length (+ also the combination of palm length & palm width) have the Americans the relatively LONGEST FINGERS; however in the perspective of hand breadth have the Japanese the LONGEST FINGERS (because their palm has the shape of a rectangle). - The Americans have the most squarish-shaped palm. - - The Japanese clearly have the SMALLEST HANDS! And they also the most 'rectangle' shaped palms (= least squarish shaped)! (they have the most rectangle shaped palm + the shortest fingers in the perspective of their body length, full hand length, and palm length). Hi Martijn, I'm not sure how you reached your conclusions. To assess 5-element hand shape we need palm length, palm width (across centre of palm), length of middle finger. eg for Uk we don't have the necessary data so impossible to assess handshape. measures palm width across metacarpals, not centre of palm. chinese boys palm length 105mm, finger length 80.2mm = 76% so fingers aren't long enough to be water shape. I reminded that I found that info a few months ago, and I have found it in the copy of the PI discussion - sorry, I have just edited/updated my analysis of the English characteristics. not sure if you saw my above edited msg re chinese. All measurements for hand breadth/palm width are made at the metacarpals (I have included a comment with the picture in my first post). Sorry, I had to edit my comment about the Chinese hands! - The element 'water' is 2nd most dominant in the Chinese. Thanks for your explanations Martijn. I think it might be a mistake to attempt to identify element handshapes when hand width is measured at metacarpals. Body length isn't a factor in assessing hand shape. I know that the elemental method doesn't include body length, and uses another approach for measuring palm width. But the trouble is... without the consideration of body length, there will always be answered questions because 'everything is relative to everything'. For example: how would you descriminate a large hand from a small hand...? Regarding measuring palm width at the metacarpals... yes, I understand that this was never included as a part of assessing 'hand width' according the elemental approach. But nevertheless... I think it's the most well-defined method that I have seen so far (and actually, I think ALL OTHER METHODS result in over-estimates of the 'true' palm width:: it can not be measured smaller than it is at the metacarpals...! ). Finally, I hope we can agree that the materials in this discussion do provide a very nice 'international' perspective.. about how the 'average' palm really looks like in terms of finger length-, palm length- & palm width ratio! PS. I hope to be able to include some Indian data as well. Hand size in relation to body height is a separate assessment, irrespective of hand shape. Yes of course everything is relative to everything else, but we have to identify the individual pieces of the jigsaw before we can put them together. Martijn (admin) wrote: Regarding measuring palm width... yes, I understand that this was never included as a part of assessing hand width according the elemental approach. Hand width is important in 5-element approach, to ascertain hand shape ie is palm square or rectangular, and also to compare against finger length in combination hand shapes. But we always use width across centre of palm rather than metacarpals. Martijn (admin) wrote: Finally, I hope we can agree that the materials in this discussion do provide a very nice 'international' perspective.. about how the 'average' palm really looks like in terms of finger length-, palm length- & palm width ratio! Yes, of course! it is very interesting to compare such things across populations. Thanks. PS. Though I tried to described the major differences regarding the 'average' (medium) results... I think it is excellent to see that the differences are usually actually relatively small (except for some details). And therefore I think it is very well possible to describe the basic characteristics for an 'average' international hand for males and females... because while the sexe-differences usually appear to be smaller than the differences between nations... I think only the sexe-related difference in 'finger length vs. palm width' is really a matter that one should include in any method! This implicates that if we would start using a relative wide range for what can be recognized as normal - then one can probably use that for people in any nation! Hand length, palm length, palm width, etc... data for 95 women, plus comparative data from other studies (including women from West India). PS. However this study also suggests that the FOOT LENGTH is a more reliable indicator for body height (table 6 presents a 'formula' to calculate body height from foot lengths and hand lengths). Nigeria: average IQ = 67; average 'hand index' = 46.9. Nigeria: average IQ = 67, average 'hand index' = 46.9. PS. NOTICE: The data from Jordania can not be used because the 'hand breadth' was measured with an alternative methode which includes the thumb. Nigeria: average IQ = 67; average 'hand index/(sqrt body height)' = 3.70. The average 'hand index' does provide a clue for the average intelligence of nations! PS. I have also added the Nigerian + Indian data in the first post of this topic. wow Martijn, I haven't digested all the info but at first reading this is an amazing discovery! well done and thanks for all your research! Yes, interesting stuff indeed... but just like in the '2d:4d digit ratio' (where any assessment should always be corrected for sexe & ethnicity)... we should be aware that any individual 'hand index' assessment should be corrected for: sexe, ethnicity + body length. So, this might actually partly explain why so far the 'hand index' never really became a research object. It's a rather complex dimension of the hand (and you and I are aware than 'hand breadth' measurement is a rather complex measure on its own). But I am exploring the possibility to combine 'hand index' with other related hand characteristics, such as the AtD-angle, and a new palmar dermatoglypic measure (that I will later describe with more details), plus some characteristics of the major palmar lines. All these hand features appear to correlate with IQ (I am working on a growing database of statistics - which confirm the links). I highly appreciate both of you for great efforts, data collection and thank you very much for healthy interaction only between you on Hand Index , I.Q. and their blending with formation as hand of nations. As an engineer I can say I.Q. graph is somewhat as a speed v/s fuel consumption graph. If hand index is decreased then I.Q. level is increased, after certain limit if it is decreased more I.Q. Level is also decreased. This notice is very critical “Hand breath is usually measured at the metacarpals, so the picture doesn't provide accurate information about that measurement.” It is not easy for palmists measure it at the metacarpals. If we put all people of nations in particular formats of hand it becomes funny to distinguish and to understand them. What you write about how to measure the hand breadth is very true, and your other consideration might also be significant... if a hand is far too small, it might indicate an anatomical problem (and not a high IQ). I have listed the 'hand indices' resulting from those average hand measurements in the picture below! PS. Unfortunately there is no data available about the body height of the Chinese & Japanese samples, so I was not able to describe the hand characteristics of those samples in the perspective of their body height. What can Finger Length reveal? The article e.g. 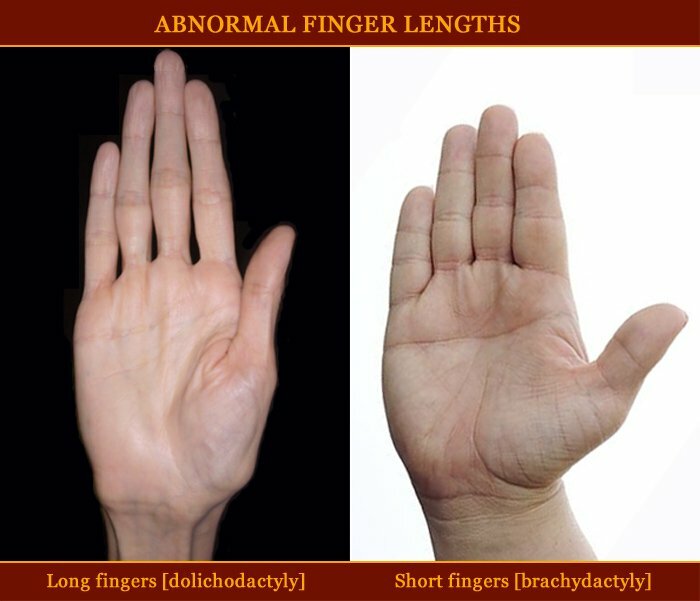 describes that when finger length is studied in the perspective of various dimensions of the palm, including length and bread... it turns out that people from India & Japan may have the longest fingers in the world! Your thoughts & suggestions are welcome! PS. Interesting, North Europe is not only the region with the tallest people, they also have the largest hands; the smallest 'hand index' (= relatively narrowest hands) is found in Latin America populations (+ North America & Japan)... and the largest 'hand index' (= relatively widest hands) is found in South China (West Africa, Eastern Europe & Australia). PPS. Here's a list of data describing hand length versus stature (page 327: average hand length in various European populations is close to 11.5% of stature in both men and women - in western Europe the percentage is usually slightly smaller: close to11.3%).